500 Top-of-Hour IDs: Fremont, Mich. 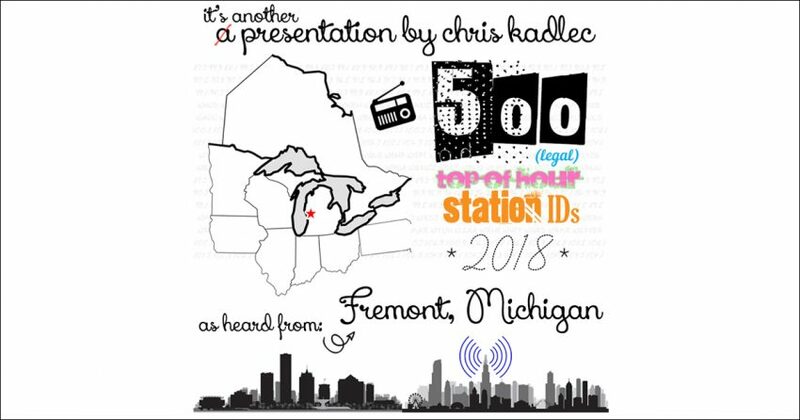 This station guide outlines all 500 stations as regularly received in Fremont, Michigan. The following stations can be heard in the related 6+ hour radio documentary, featured below. This project is my second audio documentary - the first having been released two years prior. This project involved recording more than 150 hours of radio broadcasts and editing in excess of 4,000 files to compile the most extensive compilation of stations I've managed to date. 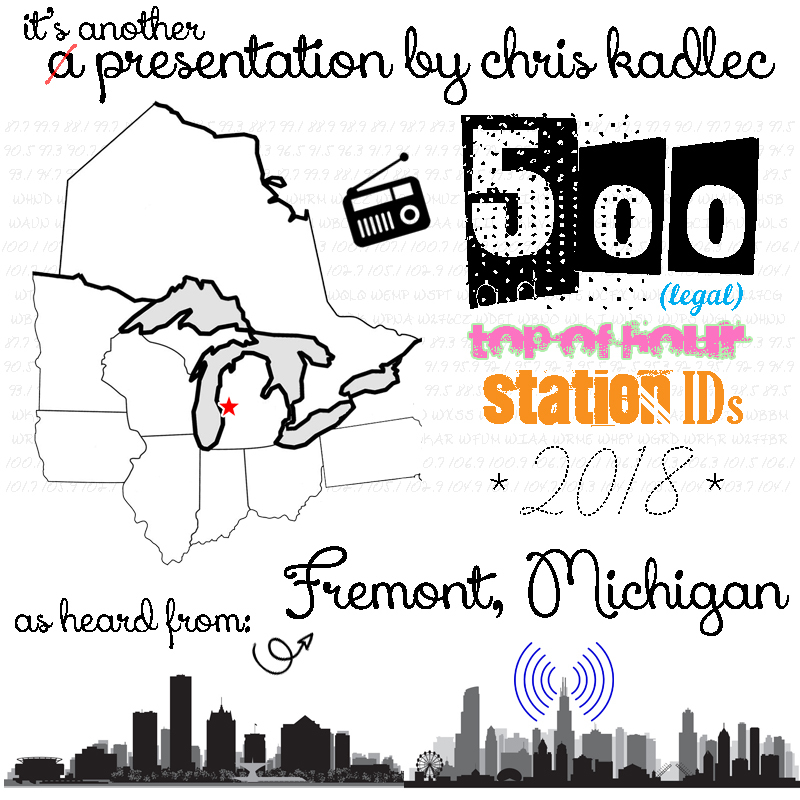 Take a 6-hour journey through the FM radio band as heard in Fremont, Michigan, from Buffalo to Minneapolis and Sault Ste. Marie to Dayton. The 500 Top-of-Hour ID audio documentary is the most thorough audio guide to radio in the Western Great Lakes region. Regular FM reception (in a broad sense, including locals, semi-locals, nighttime enhancement, and short-haul tropo) as received in Fremont, Michigan can be seen on the map above. All stations on the map are included in the audio documentary. Zoom into each station's tower by utilizing the Google Earth file or visually display stations by frequency. The chart below indicates that a total of 95.7% of the sample of 530 stations included in this guide follow the regulations suggesting stations give their legal ID within ten minutes of the top of the hour. Of those IDing early, 7 of 17 belong to just a few groups, including Woodward (3) and Midwest (2) in the Green Bay market and both Corus (2) and Blackburn (1) in Ontario. One station was entirely non-compliant with rules and one gave a legal ID after every song. Some stations broadcast either floating legal IDs with varying times, are prone to skipping legal IDs for some or many hours at a time, or are not required to give (spoken) legal IDs by the FCC or CRTC. 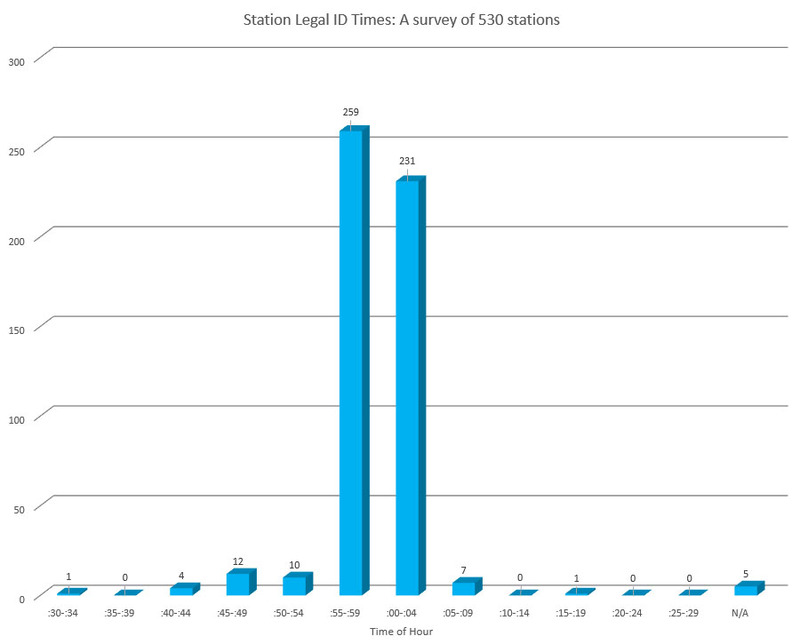 Average legal ID times of 530 stations included in this project. Not invested enough in the radio business to bother with the full 6-hour documentary or have an interest in only one or two radio markets? Here's your chance to take advantage of the regional compilations, 14 additional shorter collections of top-of-hour IDs organized by region. Though you're missing out on the commentary, bloopers, some additional stations, and more, the regional compilations are quick and basic. + 92.1 WGHN MI Grand Haven incorrectly gives all legal IDs with pre-recorded call letters WTHN. + 100.1 WVIB MI Holton airs the incorrect legal ID, replacing their city of license of Holton with Muskegon, with no alternate or hidden IDs existing. + 90.7 W214AY MI Walker does not air audible IDs, but instead uses FSK (Frequency Shift Keying) four times per hour, a non-audible method of IDing translators, as confirmed by CSN International's Director of Engineering. + 92.9 W225BL MI Grand Haven: the city of license for this station has been changed in this database as it is 25+ miles from the actual tower location and does not properly reflect the origin of the signal. + 97.3 WJWC-LP MI Grand Rapids gives spoken IDs incorrectly as WCWJ-LP and legal IDs as WJPC-LP 97.3 Grand Rapids. + 87.75 WRME-LP IL Chicago gives only a visual TV ID as required by law, but does not broadcast an audible legal ID, as confirmed by the programming director. + 103.1 W276CZ MI Saginaw: the city of license for this station has been changed in this database as it is 25+ miles from the actual tower location and does not properly reflect the origin of the signal. + 92.7 WAUN WI Kewaunee airs a split legal ID with the primary station ID (WAUN) at the top of the hour and a separate ID of the station's translators following the first song of the hour. Both are included here. + 89.9 CBE ON Windsor airs provincial news but does not provide a regional or legal ID, as is the case with all stations in the CBC Music network. + 94.3 CKSY ON Chatham and 96.7 CHYR ON Leamington do not air a complete legal ID due to relaxed CRTC enforcement, but instead mention the station call letters and sometimes the station owner at the start of every hour, confirmed through numerous hours of listening on multiple days. + 104.3 CJQM ON Sault Ste. Marie does not air a complete legal ID due to relaxed CRTC enforcement, but instead mentions the station call letters and sometimes the station owner at the start of every hour. + 106.3 WGMV MI Stephenson aired legal IDs using both their current calls WGMV and former calls WMXG through the end of 2018. Both have been included here. + 90.9 WILL IL Urbana erroneously gave the top-of-hour ID as WIML-FM and HD Urbana instead of the correct WILL-FM. + 101.3 CKOT ON Tillsonburg does not air a complete legal ID due to relaxed CRTC enforcement, but instead mentions the station call letters and sometimes the station owner at the start of every hour. In addition, they run legal IDs only intermittently as opposed to hourly. + 106.5 WRZX OH Greenville was not broadcasting any form of legal ID, nor did they give any mention of their calls or city of license, as noted following many hours of listening both throughout the day and night. Their non-legal top-of-hour ID is included instead.